We felt the need to create this FAQ section about silk to address our customers questions. After hours of scanning the Internet for silk bedding, many buyers are confused by the different terms and descriptions used to disguise the difference between real silk and polyester silk, top grade silk, and ok-grade silk. We know it can get very frustrating to find and pinpoint top quality, pure silk bedding. We hope our Q&A section below helps answer some of your questions. Please call us at 626-297-8668 if you have further questions. Q: Is your silk mulberry silk? A. Yes!!! All our silk beddings are made from 100% pure silk, produced from silk worms that are fed on mulberry leaves. That is why it is called mulberry silk. Q: What are the thread counts of your silk? A: Our thread count is 450. However, thread count is a quality measuring standard for cotton, not silk. Silk quality is measured by it’s weight, and momme is the traditional density unit for silk. The higher the momme number, the heavier and better quality the silk. Most in the market are only 10 to 15 momme but ours is 19 momme, (all 19 momme silk should have the same amount ot thread count in order to achieve the same weight) the best weight for durable silk bedding. Higher momme silk (higher than 19) is very rare and very expensive, and is actually overkill. You do not need to spend more money since 19 momme silk is strong enough to last for years. Q: What is charmeuse silk and what is satin silk? A: Silk is a natural protein fibre which can be woven into different types of textiles including silk chiffon, silk crepe, silk shantong, silk habotai, and silk charmeuse/satin. In other words, charmeuse and satin are specific types of weaves. No one uses silk chiffon to make silk beddings since it is so flimsy and light weight. Most people use silk habotai and silk charmeuse to make silk bedding. Habotai silk is a lighter weight silk that is only about 15 momme, decent enough to make silk bedding, but it will not last for a long time. Also, habotai weave does not have a smooth silky surface like charmeuse. The preferred and more luxurious choice of silk for bedding is charmeuse weave silk. Charmeuse weave and satin weave are essentially the same tight, heavy weight weave with a glossy surface and a dull back. We use the word charmeuse instead of the word satin because satin or “sateen” has been “hijacked” by polyester manufacturers who use polyester fibers in a satin weave to create the illusion of silk, and then incorrectly call it satin. The correct thing to do is to call it “polyester satin” not just satin since satin describes only the weave, not the fiber content. Our silk beddings are made from top grade 100% silk, in charmeuse weave. Charmeuse silk is so beautiful that top designers use it to make couture gowns for celebrities to wear on the red carpet. Q: I would like to try silk but I am afraid that it is going to be hard to take care of: A.Surprisingly, it is easier than most people think. Just wash the item in cold water with a mild detergent (We recommend Woolite Extra delicate care. Please make sure that the detergent states very clearly that it is for fine clothing such as wool and silk. Detergents that says they are gentle for skin are not necessary mild detergents for silk, please also make sure that you clean the washing machine thoroughly before wash to make sure there are no remnants of strong detergents of bleach left over from your last wash) Also we recommend the mild detergent in the form of liquid detergents, not soap, not powder or flakes (reason being powder or flakes sometimes do not dissolve evenly and costs discoloration , use delicate cycle, tumble dry using the dryer's low temperatur delicate cycle with fabric softener and it will turn out soft and nice. If you air dry the item you might need to iron it with low heat to restore it’s shine and softness.Silk smeared or stained by sweats should be washed or soaked in clean water immediately. The water temperature mustn't exceed 30-Celsius degree. Absolutely no bleach. Please wash silk by itself , do not mix with other harsher fabric as it will break down the more delicate silk fibers. With the right care and maintenance, our silk sheets should last for at least a couple of years. Not as long as cotton as after all silk fiber is a much more delicate fiber compare to cotton or polyester. Q: Where are your silk beddings manufactured? A. They are from China. Silk fabric was first developed in ancient China with some of the earliest examples found as early as 3,500 BC. It is still the biggest manufacturer of silk. Other countries producing silk in substantially lower volumes are Thailand and India, but their silk quality is not as smooth. Italy also makes beautiful silk but it is used predominately for garments, not silk bedding. 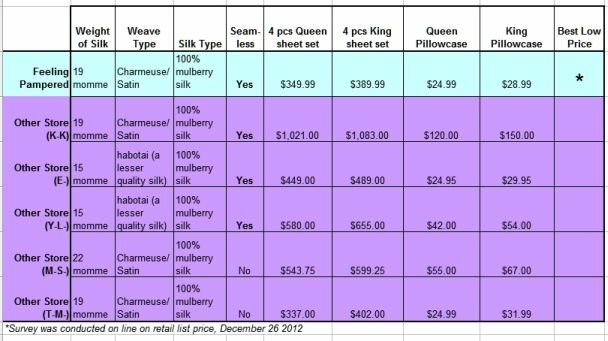 Q: Why are your prices so much lower than other etailers selling the same quality of high-end charmeuse 100% silk? A. Without naming names, a lot of the big brand names are selling at double our prices because there is a wholesale layer in between. The Brand name importers import the items, mark them up and sell them to etailers, who mark them up again before selling to consumers. It is very easy to identify them as they are those etailers that are carrying multiple brand name silk items on their website. There are no layers in between you and us since we directly import all our silk and cashmere items. Q: How long will my silk sheets lasts? With the right care and usage, they should last for average around 1 to 3 years. But there are also other elements that exist in each individual households that might affect it's life span, e.g. weight of user, tossing and turning patterns of the sleeper, frequency of wash (Try not to wash the sheets too frequently), type of water in the area, surface of the mattresses, type of mattress , dryness in the room because of heater use.....etc. Therefore outside the average, some will last for less than a year ( And yes, the fitted sheet is always the first to go while flat sheets and pillowcases will lasts for much longer)and others might last longer than 4 years...Silk after all is a much more fragile fabric than cotton and require special care and caution when you are using them.